We took what I am sure will be the last walk of the Spring this morning, due to the weather becoming much warmer. 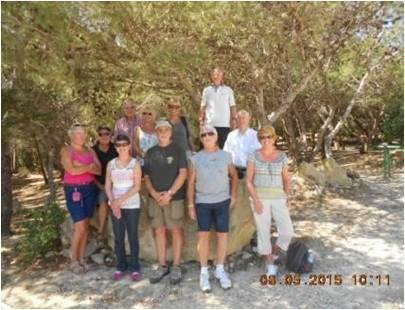 Once again we met at the Mizieb woods behind Xemxija and took the opposite direction to last month’s walk. 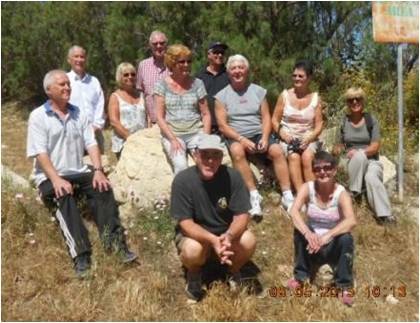 Charles pointed out several interesting facts as we took our time, slowly meandering up and down the track which was somewhat hilly in parts – though nothing that we couldn’t manage. We couldn’t help but notice how quickly the lovely green wood had turned brown and crunchy underfoot, as the very hot weather seems to have arrived a little earlier this year. Terry pointed out some W.W.2 gun placements, concrete blocks in the wood and we stopped from time to time under the shade of the trees to regroup and take a sip or two of water. I think that all thirteen of us enjoyed this last walk as we took it easy and it was purposely much shorter than previous walks this year. Thank you Charles and we’ll look forward to more walks after the summer.